A superfine, weightless loose setting powder designed to perfect and extend makeup wear for that filtered, photo-ready finish on lock—now in a mini travel-friendly size. When looking good is the name of the game, your makeup better be able to keep up. Enter Pro Filt’r Instant Retouch Setting Powder—now in a mini travel-friendly size. This superfine, insanely silky loose powder sets and extends makeup wear, working all day to blur the look of pores, fines lines, and imperfections for a hyper-smooth filter that didn’t come to play—so bring on the paparazzi. The best part? Rihanna was obsessed with creating a setting powder for everyone that wouldn’t flash back, so Pro Filt’r was born in 8 versatile shades to melt into your unique skin tone, letting you set, perfect, and brighten without a trace. And with its light-as-air blend of mattifying powders that won’t cake or settle, Pro Filt’r minimizes shine while letting skin look like skin. So you can—for once—get matte, get even, and keep your photo-ready finish on lock. BUTTER: TALC, SILICA, DIMETHICONE, SQUALANE, 1,2-HEXANEDIOL, CAPRYLYL GLYCOL, ETHYLHEXYLGLYCERIN, TOCOPHERYL ACETATE, PARFUM/FRAGRANCE, POLYMETHYLSILSESQUIOXANE, IRON OXIDES (CI 77491, CI 77492, CI 77499), TITANIUM DIOXIDE (CI 77891). CASHEW: TALC, SILICA, DIMETHICONE, SQUALANE, 1,2-HEXANEDIOL, CAPRYLYL GLYCOL, ETHYLHEXYLGLYCERIN, TOCOPHERYL ACETATE, PARFUM/FRAGRANCE, POLYMETHYLSILSESQUIOXANE, IRON OXIDES (CI 77491, CI 77492, CI 77499), TITANIUM DIOXIDE (CI 77891). HONEY: TALC, SILICA, DIMETHICONE, SQUALANE, 1,2-HEXANEDIOL, CAPRYLYL GLYCOL, ETHYLHEXYLGLYCERIN, TOCOPHERYL ACETATE, PARFUM/FRAGRANCE, POLYMETHYLSILSESQUIOXANE, IRON OXIDES (CI 77491, CI 77492, CI 77499), TITANIUM DIOXIDE (CI 77891). NUTMEG: TALC, SILICA, DIMETHICONE, SQUALANE, 1,2-HEXANEDIOL, CAPRYLYL GLYCOL, ETHYLHEXYLGLYCERIN, TOCOPHERYL ACETATE, PARFUM/FRAGRANCE, POLYMETHYLSILSESQUIOXANE, IRON OXIDES (CI 77491, CI 77492, CI 77499), TITANIUM DIOXIDE (CI 77891). Swirl Powder Puff Setting Brush 170 (sold separately) over powder, tap off excess, and dust over foundation, concealer, and contour to set. To set smaller areas of the face, such as under eyes, apply with Fenty Beauty’s Lil Precision Makeup Sponge Duo—the dual-ended sponge features an innovative velvety end made specifically for precision setting. Brushes more your thing? Try the Precision Concealer Brush 180 to set hard-to-reach areas. Don’t forget to check inside the box for a custom cap that plugs your loose powder in place! ARTISTRY PRO TIP: Going for a no-makeup makeup look? 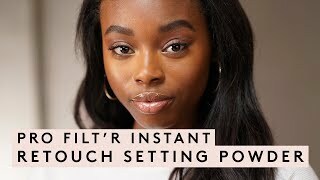 Buff Pro Filt’r Instant Retouch Setting Powder over bare skin for an instant filter effect.